Imagine trying to translate text like that above into something coherent, let alone, the most important manuscript in the world to an entire race of people. Ancient Hebrew texts containing no vowels, kept scribes busy for centuries translating “The Crown”, the original version of the Torah, until considered complete around the year 900 Anno Domini. During the crusades early in the first millennium AD, the final manuscript was taken to Europe and was moved various times over the subsequent years to locations around the Mediterranean until finally hidden for centuries, relatively unharmed, in a synagogue in Aleppo, Syria by a Jewish community. After the UN vote to create the state of Israel soon after the ending of the Second World War, widespread riots broke out resulting with the burning of the synagogue and the destruction of many invaluable treasures, artifacts and documents. Sometime after the Israeli government “acquired” the “Crown”, 40% of the pages, including some of the most significant chapters of the pentateuch, were found to be missing. Friedman’s work documents his investigation into the history of this sacred text, mostly after it’s discovery from its hiding place for centuries in Aleppo. I had been waiting to get a hold of this acclaimed piece for a few months, and now can only say that I am somewhat disappointed, perhaps because I anticipated too much from it. I am reminded of another book detailing an extensive, 10 year research endeavor for another biblical relic, the Ark of the Covenant, that I read a couple of years ago titled, Sign and the Seal: The Quest for the Lost Ark of the Covenant by Graham Hancock. Like “Sign and the Seal”, Friedman’s work piques ones interest, however, leaves only a vague conclusion based on personal assumptions which I found rather disheartening. Friedman displays his investigative journalist qualities, and obviously shows due diligence in satisfying his inquisitiveness on the subject, and perhaps got enough of the “run around” to make most people just give up on it (I thought it difficult to tell where the facts were delineated from the fabrications, which is not necessarily the fault of the author), though the author kept up his quest with unending persistence. All in all, The Aleppo Codex was an okay read, but life is way too short to spend it trying to answer, unanswerable questions. 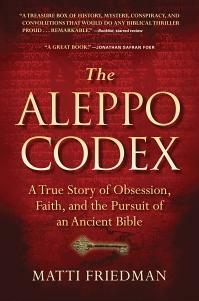 Sign into Goodreads to see if any of your friends have read The Aleppo Codex.